I've been in a redecorating mood, working on terraforming and rearranging my property for the new lodge and deckhouse, and all that work has made me hungry! While setting the table for breakfast, Atlante Guerrero of Stars Fashion sent me this sweet little Hibiscus outfit with shoes! I just love it.... thank you Atlante! It was the perfect compliment to the Good Morning breakfast table and chairs set from Bazar. The Hibiscus set is a hybrid mesh outfit which combines dress, bra, and pant on system clothes layers, but has a mesh skirt in multiple sizes worn over that, and sculpted prim belt to top off the look. The Hibiscus shoes are a high-heeled clog in white with wooden soles, and little hibiscus flowers on them. So sweet! 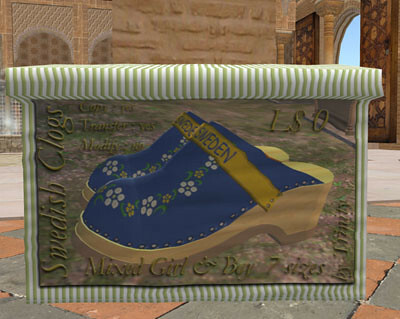 In Mera's blog just a few days ago she was showing some fabulous Swedish Clogs you can get for free , as well as a link to find some beautiful clogs in real life. I'm going to have to do that, and thanks for the tip Mera! Isn't this a lovely little place? While wandering in a daze around the Dreamseeker Home Expo looking for a new house for my little lot, I fell in love with the Matilda's Getaway cottage by Funky Junk. It's a small getaway cottage 8x15 meters and 69 prims (unfurnished) that I decided to plunk down on the deck at the base of my property, right on the water, and I'm so thrilled with it. While I bought the unfurnished model, there is a furnished version as well. A single room, attached to an open air vine covered patio with a California style outdoor fireplace (shown in this blog post). The texturing is beautiful with lovely details that make this little getaway so enchanting. From my little Secret Summer getaway... cheers, and happy shopping! Skin: Lea_Cream - Red Wine by .ploom. at the My Attic event. Exploring virtual worlds since 2007, and bringing a fresh supply of the latest fashionable wonders and creative content to enhance your online experience. What Does a Marketing Content Specialist Do? Pirate Rummage and Albannach at Wheatcliffe!